In our modern society there are words everywhere around us, all the time. They are not only written in books – that fair and most devoted carrier of text – but also on walls, where they appear in all shapes and sizes. Judging from surviving paintings, it appears that in medieval times it was less common to have words – text – displayed on walls. Looking at Ambrogio Lorenzetti’s famous fresco Effects of Good Government in the City (1338-1340) one would assume medieval walls to be spotless, both indoors and outdoors (Fig. 1) – here is another example. As I have shown in this older blog post, the world of the medieval book was riddled with advertisement; spam even. Medieval scribes and early-modern printers praised their own work in order to draw a crowd to their shops: “If you also want a beautiful copy like this, come and see me across the street from the Notre Dame Cathedral”, the entrepreneur-scribe Herneis wrote in the back of a book with stories in Old French, which he had just completed (image here). Herneis tried to lure the reader of this spam message to the Rue Neuve Notre Dame, where a large group of commercial book makers were situated, namely all those who sold books in the French language. For Latin books you needed to go to the Rue St Jacques, in the Latin Quarter where students and teachers lived. Because tradesmen of a certain kind usually had shops in the same neighbourhood, medieval citizens knew precisely where to go when they needed a book, a candle or a good chair – or all three, the perfect combination. This location sharing by individuals selling the same goods also came with a problem: how to convince the reader to step into your shop and not the neighbour’s? This is where the first poster comes in: the advertisement sheet (Figs. 2-3). 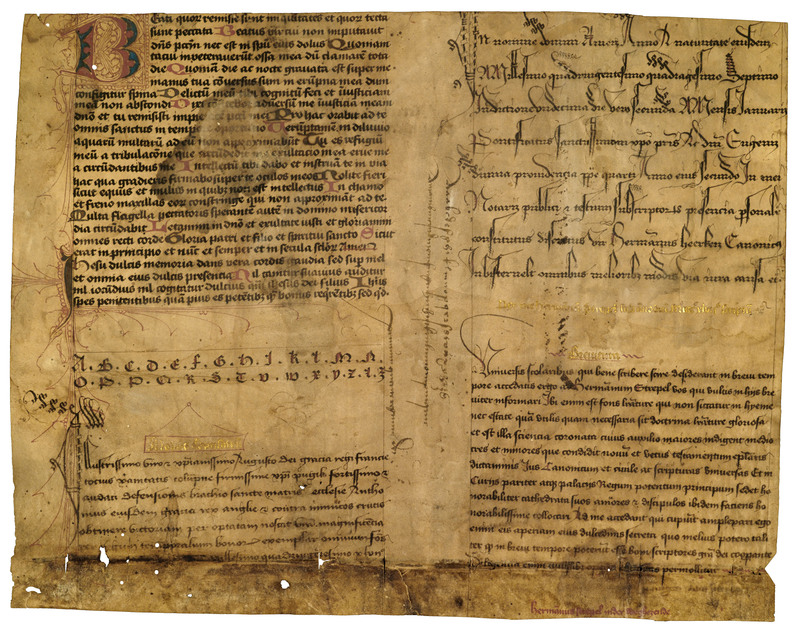 Both fragments seen here were once part of much larger sheets, which displayed many different types of scripts. It allowed the commercial scribe to show off how well he could write and just how many different scripts (medieval typefaces) he has mastered. The one seen in Fig. 2 even displays letters written in gold, as if to tempt the reader to take a closer look at all the pretty letters on display. The back of advertisement sheets are empty and in some cases their corners display rusty holes, which suggests they were pinned to a wall. A German sheet from 1516 invites the beholder to “come in if you see something you like”, showing that this particular sheet acted as mini window displays outside of a shop. Because such sheets also presented the names of the scripts, as seen in Figs. 2-3, the client could simply enter and tell the scribe in what kind of script he wanted his book to be written out – for example in ‘fracta’, ‘rotunda’ or ‘modus copiistarum’. These posters show us just how advanced the book trade is even before the invention of print: a jargon had emerged that united artisans and connected clients to commercial makers of books. Much better known posters are wall maps, though these too survive in small numbers. 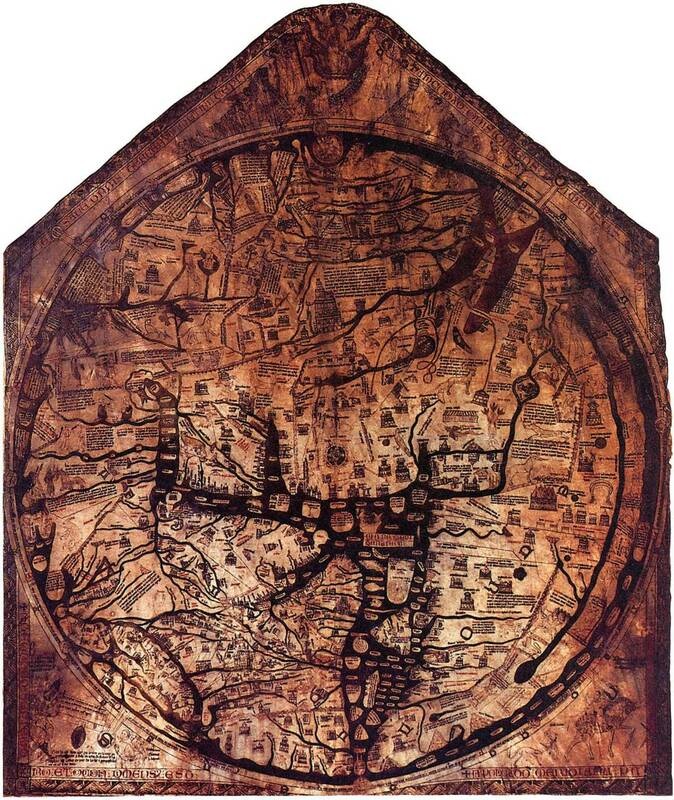 The perhaps best known specimen is the Hereford Mappa Mundi (Fig. 4), which was produced around 1300 and measures an astonishing 1.5 x 1.3 meters. This particular map was perhaps first put on display in Hereford Cathedral for the benefit of pilgrims, although 17th-century references suggest that by that time it was placed in the library, perhaps so it could be consulted for study purposes (source). 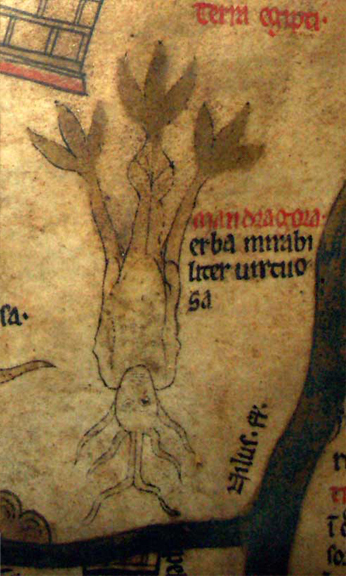 The map contains, after all, over a thousand inscriptions and legends, such as that of the Mandrake, with roots for hair – and immortalised by the Harry Potter books (Fig. 5). 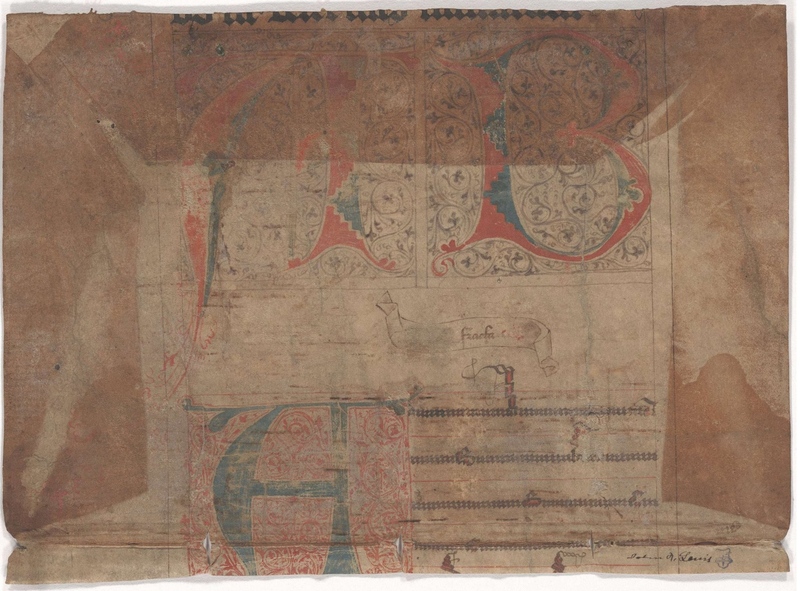 Remarkably, the Hereford map is made of a single sheet, meaning the piece of parchment at its heart was once draped around a monster of a calf. 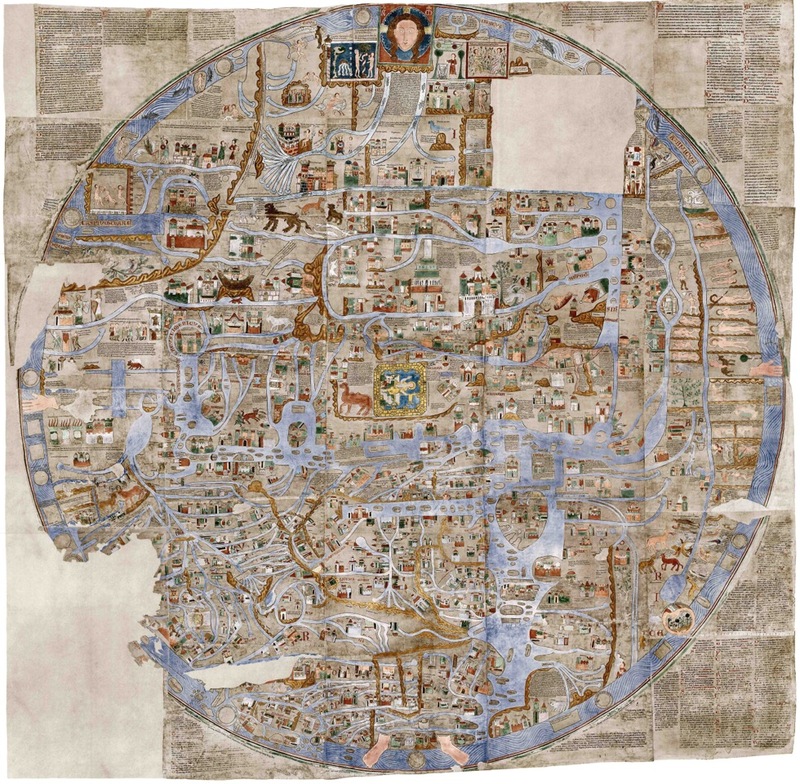 Much larger still is the older Ebstorf Mappa Mundi, which measures 3.6 x 3.6 meters and was produced in the late thirteenth century (Fig. 6). This beast of a poster, which would cover a full wall in a modern bedroom, was produced from the skins of no less than 30 goats. The Ebstorf map, which was sadly lost in the Allied bombing of Hanover in October 1943, was produced for contemplative purposes for the inhabitants of the Benedictine nunnery of Ebstorf. It allowed the beholder to observe God’s creation, the world, in all its details (more about its function here). Surviving artefacts highlight the existence of yet a third category of medieval posters: wall catalogues. Again these are fairly large sheets, sometimes composed of several animal skins. The information on these objects is of a most practical kind, given that it showed readers where in the library they could find copies of certain texts (Fig. 7). As explained in this blog post, the catalogue was one of a series of instruments that helped readers find their way around the sometimes large collection of books in the monastery. 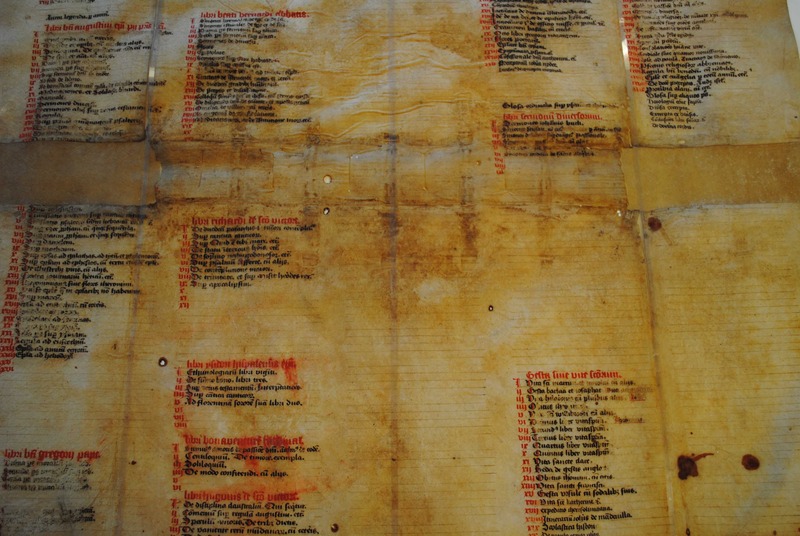 The object originally measured 800 × 590 mm and displays the contents of the library of Lopsen Abbey near Leiden, where it was pinned to the wall considering the holes in its corners. The inventory is divided into categories, such as “libri refectoriales” (books read during the meals) and “libri devoti et utiles” (books for personal, spiritual development), while books within these categories are simply numbered with Roman numerals. It shows that this is an inventory more than a catalogue. The absence of proper shelfmarks meant the reader had to go and hunt individual copies when he arrived at the lectern that held a certain category of books. As you would expect from objects that were attached to damp walls, their backs may show signs of mould, as is the case in another wall catalogue surviving from the Low Countries (Fig. 8, lower left corner). There was likely much more on display on the medieval wall. The problem, however, is that even if such posters survive, it is difficult to determine that the items in question were just that. To be sure, certain damage needs to be observed, such as pin holes or mould. Quite often we just don’t know for sure if we are dealing with a display sheet, even though there are good reasons to suspect it. 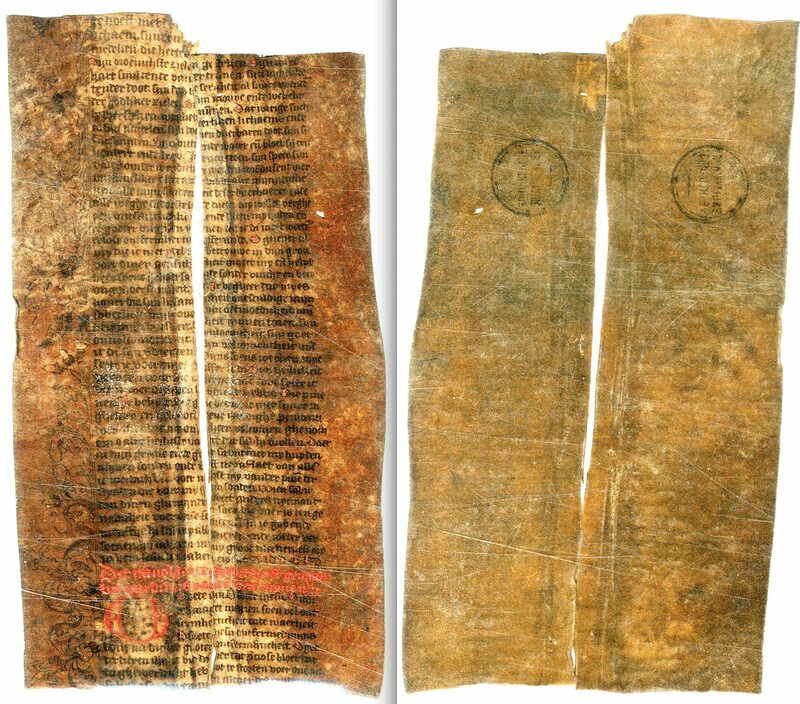 For example, the preserver of manuscripts at the Royal Library The Hague, Ed van der Vlist, recently found two heavily-damaged fragments (from the same item) that fit the bill quite well: a single sheet with a text on John the Baptist of which the back remains blank (Fig. 9). 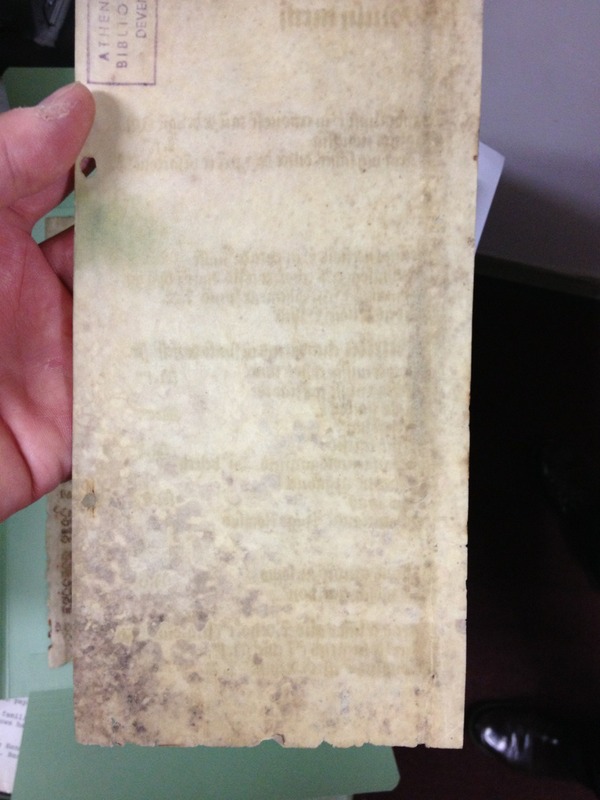 However, while this item may well have been pinned to a wall at some point, the backside does not show any evidence of such an attachment: there is no damage or mould visible. Sadly, the example shows how a particularly fascinating type of written artefact from the age before print, the precursor of our modern poster, may be doomed to remain obscure and understudied. Fascinating article. So much to learn; so little time. Thenk you! Thank you. One post at the time! This post gave me smile. Fascinating! I am thinking that those medieval adverts were a bit elitist. I wonder what proportion of the population might have been able to read words in 1500? I can see what a wonderful success the maps and drawings would be. I love pictures and visuals. I do believe a picture tells a thousand words. Thanks for this post, great information. You’re welcome – thanks for visiting! for inquiring the Ebstorf map.